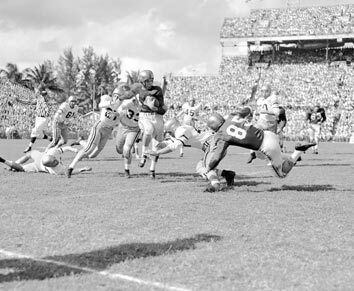 Baylor quarterback Larry Isbell runs upfield as Harold Riley (85) tries to throw a block in the 1952 Orange Bowl. The Bears lost to Georgia Tech, 17-14. Baylor’s Reuben Saage (left) and Del Shofner in the locker room after the Bears knocked off previously undefeated and No. 2-ranked Tennessee, 13-7, in the 1957 Sugar Bowl. “The reason for their grins is obvious,” the Associated Press caption reads. Baylor quarterback Cody Carlson threw for two touchdowns in the Bears’ 21-7 victory over LSU in the 1985 Liberty Bowl in Memphis, Tenn.
Baylor coach Grant Teaff celebrates after the Bears’ 21-9 victory over Colorado in the 1986 Bluebonnet Bowl. Illinois receiver Ryan Lankford pulls down a long pass against Baylor cornerback Mikail Baker in 2010’s Texas Bowl in Houston. The Bears’ return to the postseason ended with a 38-14 loss to the Illini at Reliant Stadium. Baylor running back Glasco Martin is lifted by teammates after scoring a touchdown against UCLA during the first half of the 2012 Holiday Bowl in San Diego. Heisman Trophy-winning Baylor quarterback Robert Griffin carries off the Alamo Bowl trophy after a wild 67-56 win over Washington to complete a 10-3 season. Baylor fans were out in force, making the road trip for the Bears' first BCS bowl appearance in the Tostitos Fiesta Bowl on Jan. 1, 2014. Baylor lost to UCF, 52-42. Penn State head coach Joe Paterno (right) speaks at a press conference on Dec. 28, 1974 prior to the Cotton Bowl. It was the Bears' first bowl game under Grant Teaff (left) and BU's first in 11 years. Despite being named the Cotton Bowl's outstanding offensive player with a record-setting performance, Baylor QB Bryce Petty was in no mood to celebrate. “It’s all for naught when you lose,” he said. Baylor University head football coach Art Briles celebrates Tuesday after the Bears defeated North Carolina 49-38 in the Russell Athletic Bowl game in Orlando, Florida. Baylor wide receiver Ishmael Zamora (right) scores a touchdown as Boise State safety Cameron Hartsfield defends during the second half of the Bears' Cactus Bowl 31-12 win in Phoenix. Baylor quarterback Charlie Brewer (from left), head coach Matt Rhule and athletic director Mack Rhoades celebrate their bowl win over Vanderbilt. The Bears had a historically great run with head coach Art Briles, notching seven straight bowl appearances from 2010-16, including playing in the Bowl Championship Series. Under new head coach Matt Rhule, the Bears missed bowl eligibility for the first time since 2010 before winning a captivating Texas Bowl over Vanderbilt in Rhule's second year to run their all-time bowl record to 13-11. Jan. 1, 1949, in Birmingham, Ala.
Bob Woodruff coached Baylor to a victory in its first bowl appearance. The Bears jumped on the Demon Deacons and led 20-0 at halftime with touchdowns from Sammie Pierce, Jerry Mangrum and Harold Riley. The Yellow Jackets scored 10 points in the fourth quarter to rally past the Bears and hand them their first bowl defeat. Baylor took a 14-7 lead at halftime on Jerry Coody’s 5-yard run, but couldn’t hold the advantage. Dec. 31, 1954, in Jacksonville, Fla. The Tigers scored five of the first six times they touched the ball in a New Year’s Eve rout. Reuben Saage and L.G. Dupre put up the only points for Baylor. Regarded as the Bears’ best bowl win. Saage recovered a fumble in the fourth quarter to set up Buddy Humphrey’s winning 1-yard TD run to beat Johnny Majors and the undefeated Volunteers. Dec. 31, 1960, in Jacksonville, Fla.
Baylor rallied with two touchdowns in the fourth quarter, but Ronnie Goodwin juggled and dropped the winning 2-point try. Baylor quarterback Bobby Ply set a then-Gator Bowl record with 13 completions. The Bears took advantage of eight turnovers, and Don Trull was named MVP after rushing for one touchdown and throwing another score in the rout of the previously undefeated Aggies. James Ingram caught 11 passes for 163 yards, including two touchdown passes from Trull in the fourth quarter. Trull threw for 255 yards in the game, while the Bears held the Tigers to 108 total yards. The Bears took a 7-3 halftime lead before the Nittany Lions exploded in the second half to whip the Southwest Conference champions. Ricky Thompson caught two touchdown passes, and Steve Beaird rushed for 84 yards and a score for Baylor. Mike Brannan threw two touchdown passes and Mickey Elam added another to help Grant Teaff earn his first bowl victory as Baylor’s coach. “Bear” Bryant’s Crimson Tide dominated the Bears in Baylor’s last appearance on New Year’s Day. Baylor managed just 158 yards and got its only points on a safety by Tommy Tabor. The future Big 12 rival Cowboys raced to a 21-0 lead in the first half and cruised to the victory. All-American Gerald McNeil caught 10 passes for 163 yards and both touchdowns for Baylor. Dec. 27, 1985, in Memphis, Tenn.
Cody Carlson threw touchdown passes to Matt Clark and John Simpson as the Bears dominated the Tigers for the second time in a bowl game. MVP Ray Berry led a stellar defensive effort to shut down the wishbone of Baylor’s future (and now former) Big 12 rivals. Derrick McAdoo had two 1-yard touchdown runs for Baylor. Dec. 31, 1991, in Tucson, Ariz. The Hoosiers raced to a 17-0 halftime lead, and the Bears couldn’t come back in their first bowl game west of Waco. Melvin Bonner caught touchdown passes of 61 and 69 yards to help send Grant Teaff out a winner in his final game as coach. The nation’s No. 1 defense shut down the Bears in their first Alamo Bowl appearance, which was the final bowl appearance period until the Briles era. Baylor’s Jeff Watson was intercepted in the end zone in the final minute to end the Bears’ hopes. The Bears’ first bowl game in 16 years didn’t have a happy ending, as Mikel Leshoure rushed for 184 yards and three touchdowns for the Illini. Kendall Wright’s 39-yard touchdown pass trimmed the lead to 24-14 early in the fourth quarter, but Baylor could not stop Illinois, which gained 533 total yards. Making its first bowl trip to California, Baylor did its part to uphold Holiday Bowl tradition by scoring fast and often. UCLA’s vaunted offense never lived up to its billing. And that’s because Baylor’s defense played like it was ecstatic to face any team that doesn’t call the Big 12 home. It added up to a tour de force performance by the Bears as they pounded the No. 17 Bruins for their most lopsided bowl win in school history before 55,507 fans at Qualcomm Stadium. Jan. 1, 2014 in Glendale, Ariz.
After the No. 15 Knights scored the game’s first two touchdowns, the No. 6 Bears began the night battling out of a hole. They stayed there most of the night as UCF pulled away for a 52-42 win before 65,172 fans at University of Phoenix Stadium. UCF junior quarterback Blake Bortles showed why he’s projected to be a high NFL draft pick if he chooses to come out early as he hit 20 of 31 passes for 301 yards and three touchdowns. The 6-4, 230-pound Bortles also ran for a career-high 93 yards and a touchdown. With Bryce Petty setting a Cotton Bowl record for 550 passing yards, it looked like the Bears would win comfortably as they took a 41-21 lead into the fourth quarter. But two Michigan State scores cut the lead to six, and following a blocked Baylor field-goal attempt, the Spartans moved 45 yards for the winning touchdown, then intercepted Bryce Petty with two seconds remaining to seal the win. The back-to-back Big 12 champion Bears finished with an 11-2 record for the second straight season following consecutive major bowl losses. Setting a FBS bowl record with 645 yards rushing, the No. 18 Bears stomped and pounded their way to a 49-38 win over No. 10 North Carolina. Coming into the game hammered by major injuries (quarterbacks Seth Russell and Jarrett Stidham, Biletnikoff Award-winning receiver Corey Coleman, running back Shock Linwood and lineman Pat Colbert), the Bears dusted off the single wing, one of the oldest and most basic offenses in the books. It would be Briles' final game at Baylor. After enduring one of the most difficult seasons imaginable, Baylor could have easily mailed it in for the Cactus Bowl and ended the season with its seventh straight loss. Instead, the Bears played some of their most inspired, daring football of the season as the Bears rocked the Broncos at Chase Field. Freshman Zach Smith passed for 375 yards while KD Cannon caught two touchdown passes and the Baylor defense came up huge, delivering one big play after another. The Bears finished the year with a 7-6 record, posting a season-ending win after losing their last six games following a 6-0 start. It was interim head coach Jim Grobe's final game. Charlie Brewer put the whole package on display in this one: With a winning season on the line, the Baylor sophomore quarterback pulled everything he had out of his big bag of intangibles by hitting crucial passes, making gutty runs and sometimes turning nothing into game-turning plays. Baylor won its third straight bowl game as the Bears outlasted a salty Vanderbilt squad, 45-38, to capture the Texas Bowl title in a thriller that clinched a 7-6 record for the Bears. Just one year after finishing 1-11, the Bears clinched a bowl berth on the final day of the season with a 35-24 win over Texas Tech in Arlington. Baylor head coach Matt Rhule, in his second year, took a major step in rebuilding a program that was wrecked by a sexual assault scandal when he arrived from Temple 23 months prior. Check out this this Dave Campbell piece from Baylor's last Cotton Bowl appearance vs. Alabama in 1981. To say last week was a productive one for Kim Mulkey and her family would be an understatement.